What’s worse than getting busted? 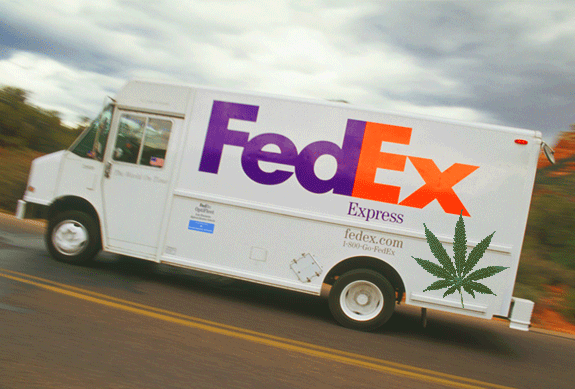 That would be when the FedEx guy drops by with a package of weed when the bust is in progress. Do you think you’re having a bad day? Sure, there are always day-to-day dramas – and some are worse than others – but if you believe in luck, then this guy has the worst. Last week, in what could be the worst case of bad luck possible, an Oklahoman man had just had been raided by the police – resulted in 76 pounds of weed being seized – as FedEx made a delivery of, wait for it, even more weed. The man, Dustin Drank, was arrested in Tulsa after the bust. During the raid, the police allegedly found 76 pounds of your favorite herb, as well as $19,000 in “drug proceeds,” across two residences. But the really bad luck came in the form of a delivery, which took place during the raid, where a FedEx truck dropped off boxes to a house that were also found to have some more weed. FedEx Ground does not tolerate the use of its network for illegal shipments. We are cooperating with authorities as they investigate this incident. The 35-year-old man was charged with possessing or receiving drug proceeds and has a $30,000 bond. It seems it wasn’t the first time Drank has been on the wrong side – or is it the right side? – of prohibition, though, as KRMG reported the officers said Drank was caught in a drug bust in 2013 that resulted in two pounds of weed, worth about $8,000, being seized.